Modern living is toxic living, thanks to an overabundance of pollution and processed foods in the average urbanite’s diet. To clarify, toxins are basically substances that are considered to cause physical harm or damage – the best example would be alcohol, which most of us have likely over-indulged in throughout the holidays, but sugar, white flour and caffeine are other common culprits. Excesses of chemicals, sugar, processed flours, herbicides and pesticides, preservatives and sweeteners found in modern food supplies stress out the pancreas and liver, sometimes even leading to diseases like diabetes and cancer. But it’s not just what you eat or drink that should lead you to clean up your eating habits – of course, toxins are found in our air thanks to smokers, pollution from industry and cars; and there are toxins in cosmetics too, which we absorb through our skin. In short, we poor humans have never had to suffer such a toxic load before in history, so it’s definitely a good idea to clean out your system whenever possible. Personally, I believe that as with exercise, detox eating shouldn’t be a temporary diet; rather, it should be embraced as a way of living. 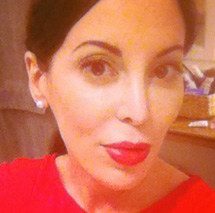 Every day, we should try to buy organic food whenever possible; avoid skincare and makeup products that are not all natural (check out our shop for organic and healthy beauty items if you’re not sure where to buy) and of course, avoid ingesting known toxins like alcohol, prescription medications, cigarettes and caffeinated drinks. This all becomes a bit easier when you know what to eat, of course! The recipes below have been chosen for their abilities to cleanse the body. For example, watermelon and cucumber are high in water, so I selected quite a few drinks and soups here to flush out the kidneys (but of course, the best thing you can do to detox is drink lots of fresh mineral water, too). Beetroot is a powerful blood cleanser, and has been included here for that reason, whilst recipes heavy in garlic and onions were included to boost immune function. 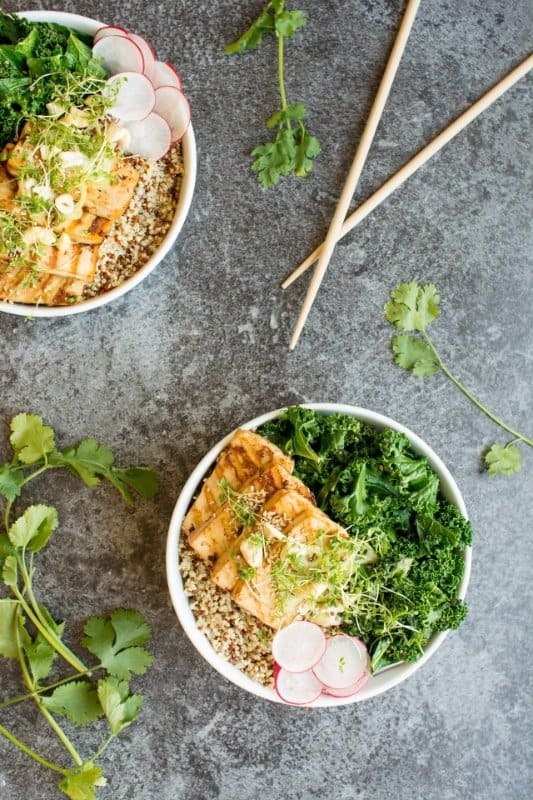 Dishes with ginger and cinnamon were also included because they halt the inflammation in the body that can lead to disease over time, and the many greens that are found in the recipes boost your body’s vitamin intake, providing nutrients and fibre for cleaning out the digestive system. If you want to get used to eating more healthily, I’ve tried to make that super simple: just scroll down the list for your favourite breakfast, lunch and dinner recipes, and mix and match them throughout the week. Eventually, you’ll find some that you really love, and that are easy for you to make, and they’ll become part of our habitual meal routine. I’ve also thrown in some snacks in case you get hungry. Remember, clean eating doesn’t mean depriving yourself of food, so tuck into what you want, when you want. Drinking your vitamins is a great way to reap the rewards of plant based goodness. 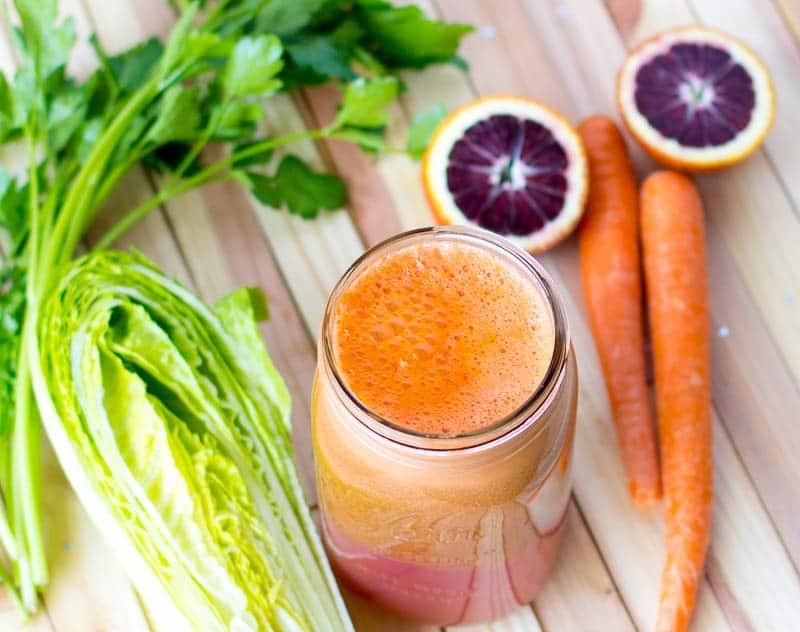 This juice is packed with veggies, but the ginger in this juice is the real detox winner – it’s perfect for warding off colds and flu that you may come down with when your system is overloaded with toxins. If you’re looking for a bit of the ‘hair of the dog’ after a rough night out clubbing- try this virgin take on the mojito cocktail instead. Cucumbers, lime and mint not only fight inflammation and keep your breath fresh, they help support your digestive system, too – which probably needs a little TLC after too much weekend fun. There are lots of reasons why you need to take care of your liver. Aside from the obvious overload of champagne, a diet rich in carbohydrates, sugar and processed fats puts a lot of stress on this organ, which is ultimately responsible for cleansing your bloodstream. You may not be aware how your lifestyle impacts your liver; whether you exercise too much, live in a city bustling with polluted air or simply find you don’t get enough sleep at night, your liver takes a blow. But the good news? 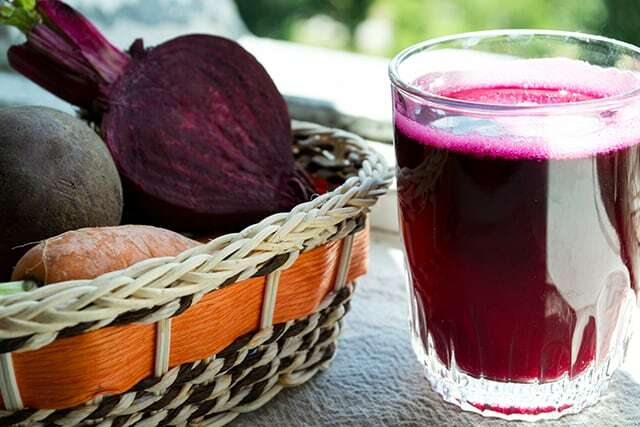 Beetroot offers a really powerful liver cleanse! And this recipe is basically just…beets. We’ve detoxed our liver and now it’s time to lend a little TLC to our kidneys. They work 24/7, so a kidney cleanse is a great thing to especially if you’re suffering from severe energy slumps. 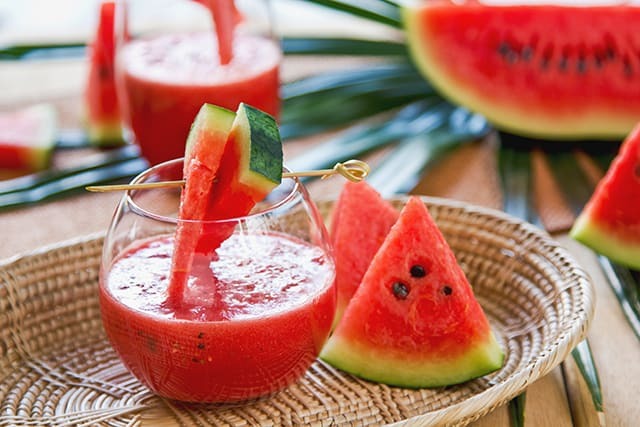 Watermelon is the perfect ingredient to flush out your kidneys as it’s basically water, but better tasting. Blend it together with a lime and it’ll give you both a refreshing and zingy drink that will feel more like a treat than a cleanse. 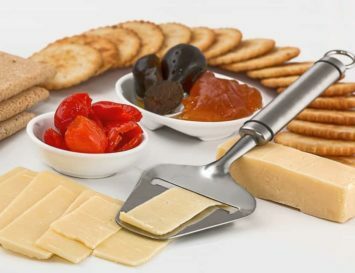 Prefer something savoury in the morning? This dense and filling chickpea pancake is packed with protein and fibre. Feel free to change up the mix-ins and toppings based on what you have in your fridge. 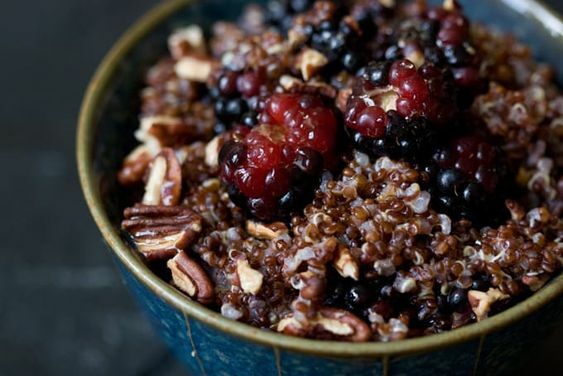 Granola is delish, but it can be a problem if you’re trying to eat gluten free. And actually – gluten can irritate the guts of many, even those who don’t consider themselves sensitive to the stuff. The solution? This gluten free quinoa bowl. Just as sweet and tasty as granola, but with more nutrients and protein. 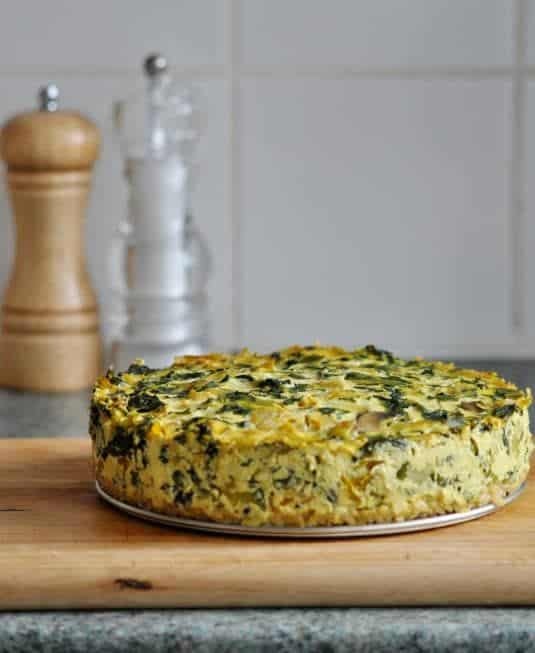 This beautiful frittata is very versatile: the vegetables can be shuffled around a bit, for example – potatoes are really good in this, as is any green leafy vegetable or member of the squash family. Great for lunches as well! 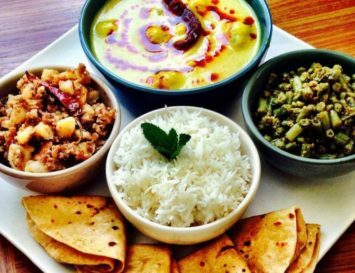 The middle meal of the day shouldn’t make you feel heavy and weighed down. 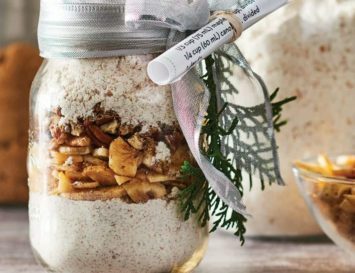 These recipes are all easy to make, and to take to work, as well – just put the soups in a Mason jar and reheat in the office microwave. 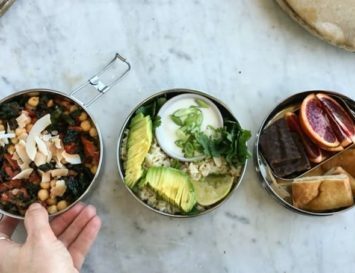 This is a great, quick lunch to make that’s not only tasty and light, but totally packable for work, too. 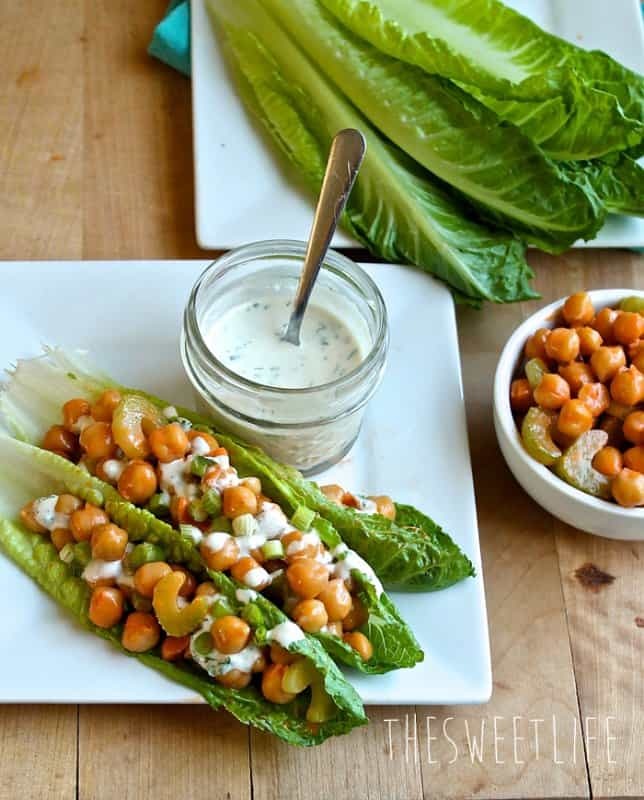 The chickpeas and lettuce add some fibre, but the real detox stars here are the apple cider vinegar, garlic and lemon juice. Ever fancied tasting the rainbow? Well now you can. 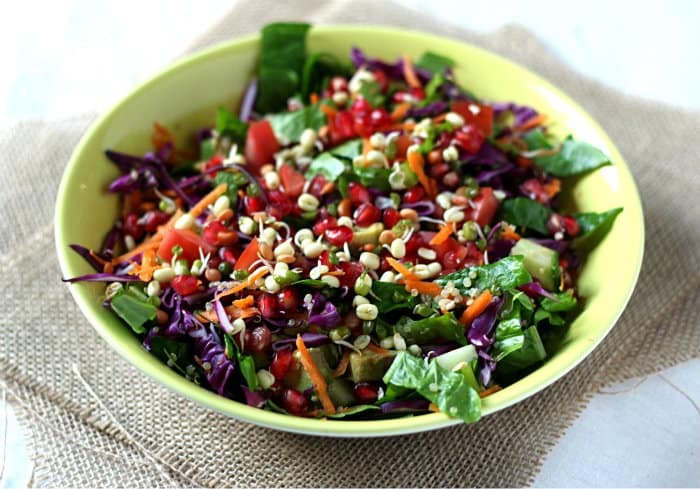 Not only is this salad bright and bursting with colour, it’s packing a real flavour punch, too. It’s got a variety of different veggies, and the addition of quinoa makes it filling enough for a meal on its own. The optional dressing is pretty tasty too, with the addition of ginger and honey. 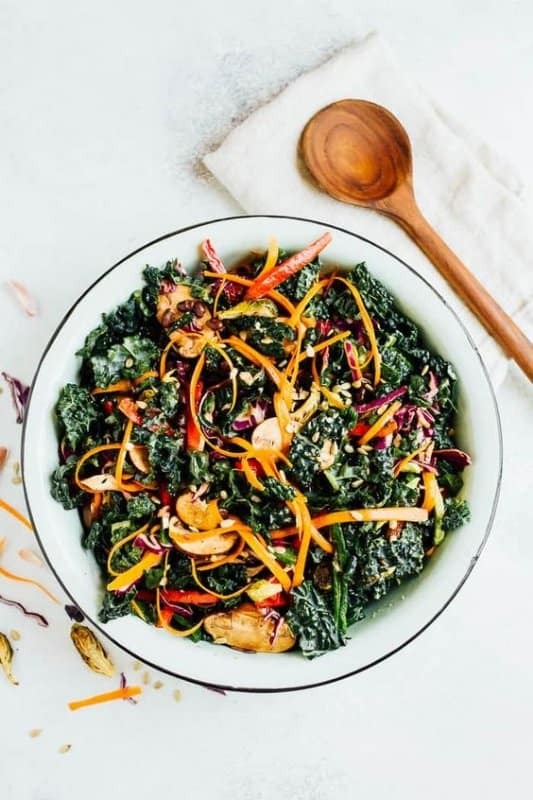 With the super detoxifying beetroot, kale, and apple, there’s a lot of crunch in this salad and it’s going to leave you feeling amazing. But remember: the whole beauty of salads if that you can put whatever you like in them, so if there’s some ingredient you’d prefer, switch it up, girl. 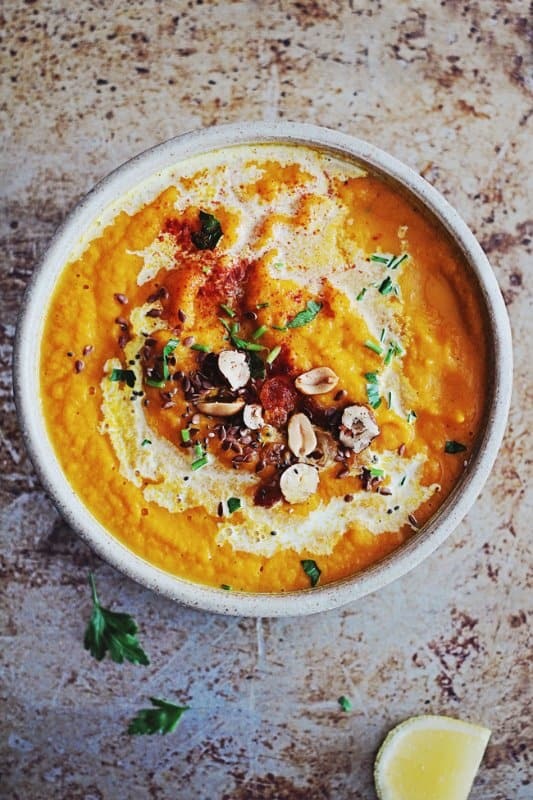 Not only is this soup packed with vitamin A and lots of fibre, it’s just damn right delicious. The sweet spud blends well with the flavours of carrot, parsnips and onion, then it’s lightly seasoned with a range of flavours, and has that most serious of detoxing ingredients; garlic! Make a double amount and take it with you to work all week. 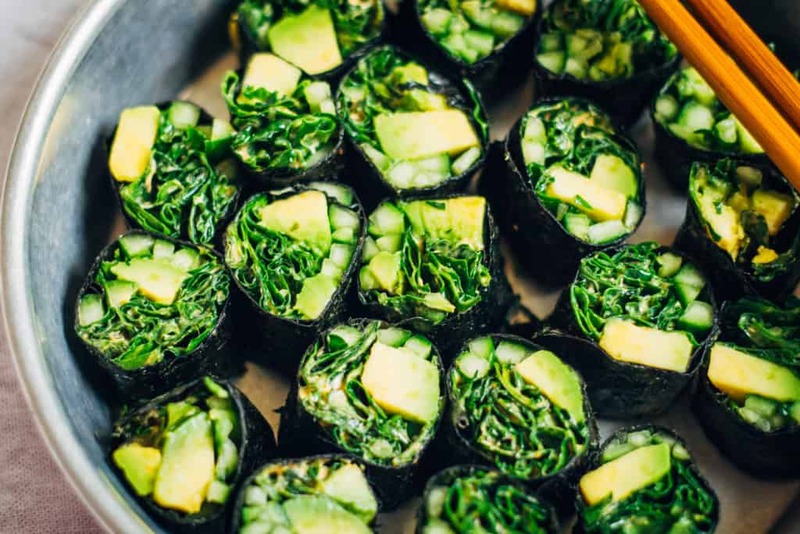 If you’re looking to detox but don’t fancy eating salads, why not make these cleansing sushi rolls? They’re substantial and filling and so good for your body. These don’t have rice or quinoa in them but are instead made up purely from green goodness, making them a truly detoxing dish. Don’t get the idea that these are at all bland – the vegan mayonnaise and hot sauce add a fab little twist. 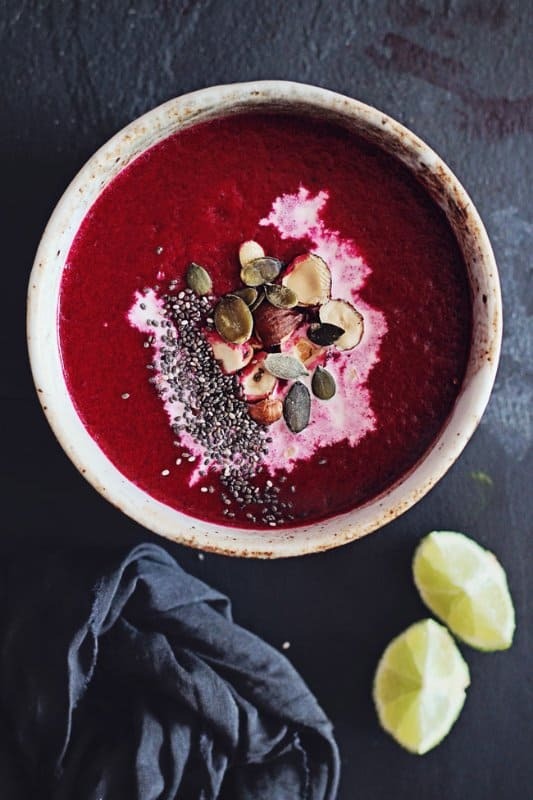 This beetroot soup looks amazing with its vibrant colours and thick consistency. Working with the earthy yet sweet flavour of blood-cleansing beetroot is red onion, garlic (obviously) and fresh coconut milk. 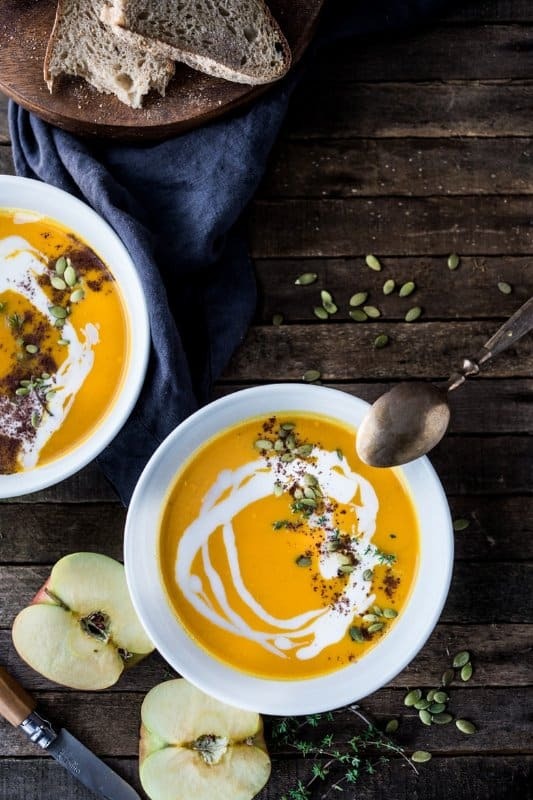 Who said soups were boring? 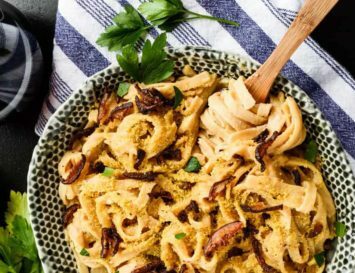 Of all the healthy vegan meals listed here, this is one of the easiest to make. Coupled with the tastes of onion and garlic this soup is be quick and easy to make. It makes for a nice, filling supper, and is full of flavour, whilst working hard to cleanse and replenish the body. This is a really thick soup, perfect for those of you who don’t enjoy basic broths and long for something heartier. 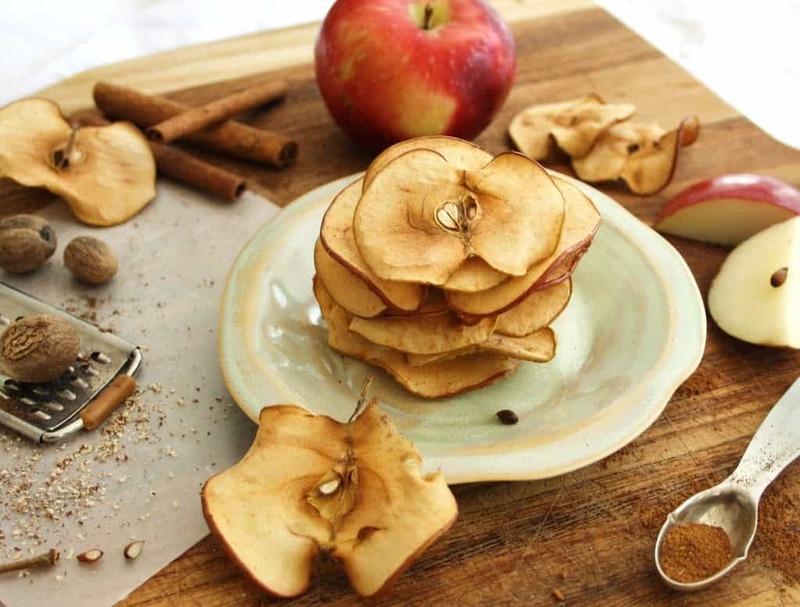 The main detox divas in this dish is actually the apple and spices: cinnamon and nutmeg, work to reduce inflammation in the body. Who doesn’t love a good spring roll? Or should I say ‘fresh roll’, since spring rolls are normally fried. 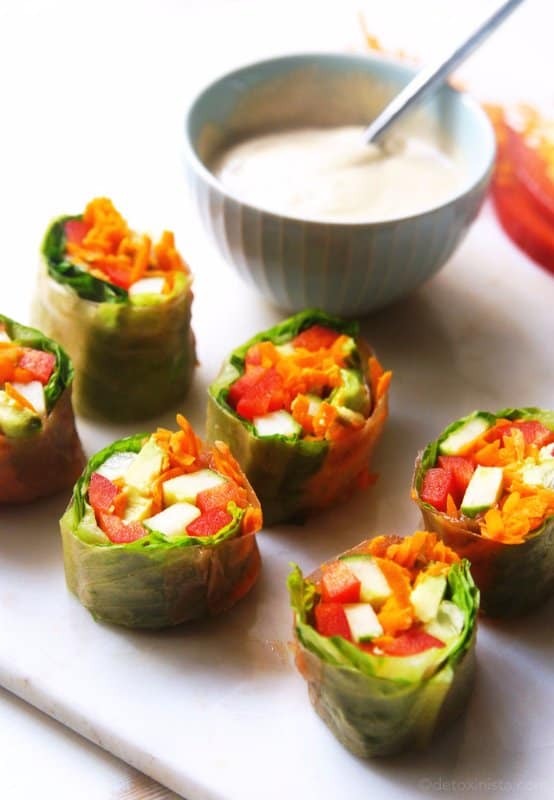 Not so these detox rolls, which are packed with veggies and come with a tasty peanut sauce for dipping. 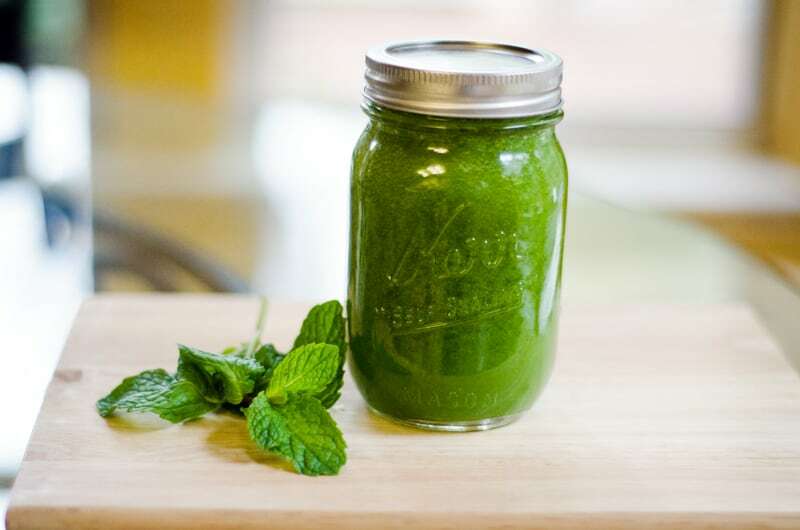 My only alteration to this concoction would be the addition of loads of cilantro, thanks to its seriously detoxifying properties – it basically leaches out heavy metals from the body. 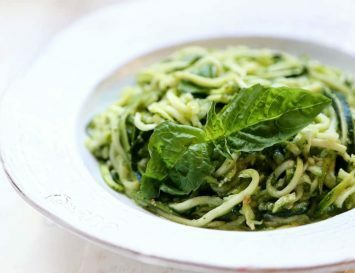 It’s easy to make hearty, detoxifying meals. 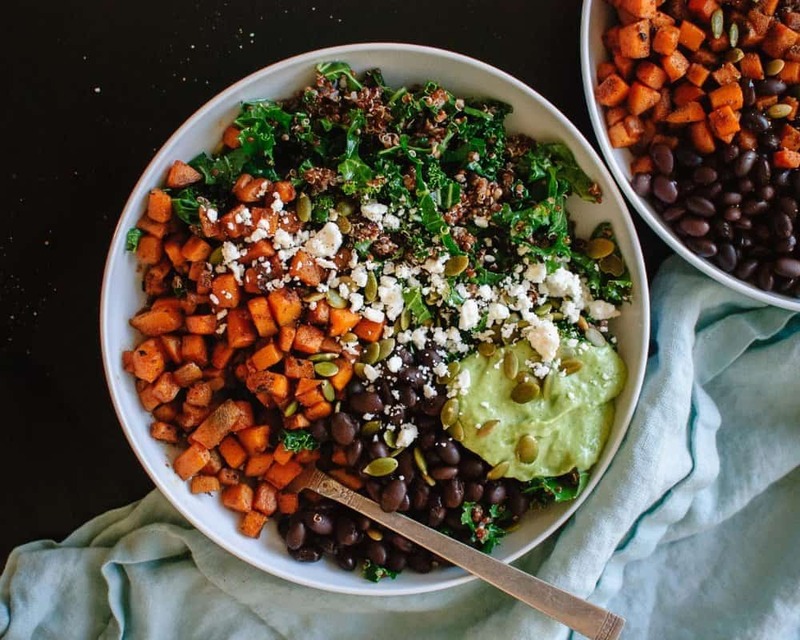 The key to a banging dinner is variety – and that’s why I added a bunch of bowls here; by definition, the ‘Buddha Bowl’ is packed with a number of different tastes and textures. 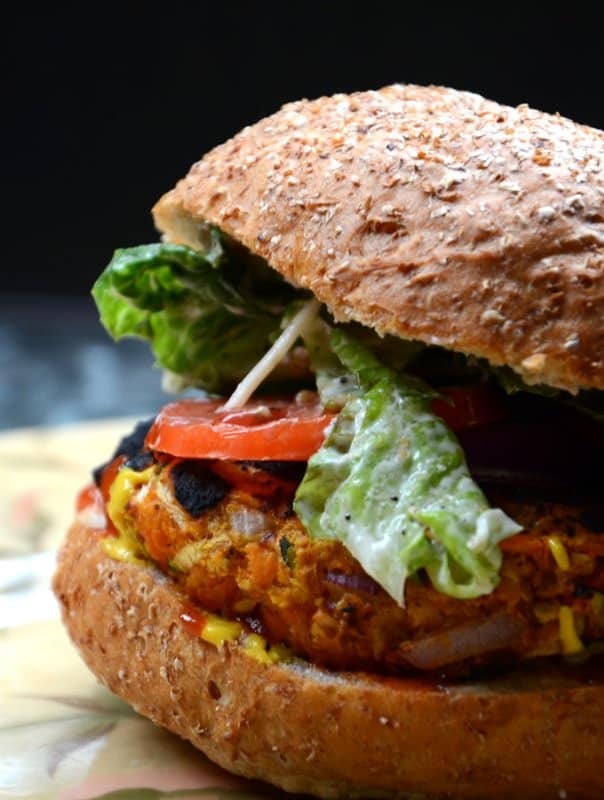 But here too are some super healthy vegan burgers you could serve with one of the salads or soups above. Whilst cleansing, it’s vital to keep your body running on foods that provide some energy. Cleansing is in no way about starvation – it’s more about giving your body a little break from processed foods. 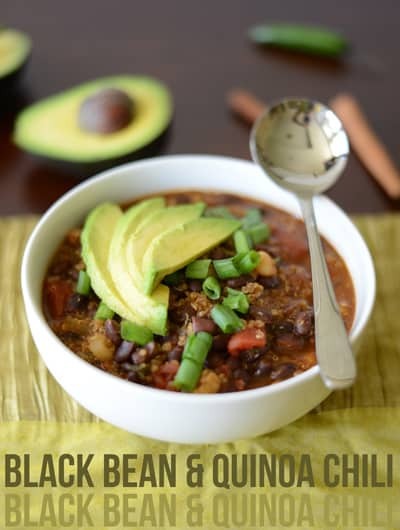 This black bean chilli soup is a really fab recipe for creating a healthy yet filling dinner with zero processed crap. If whilst detoxing your body your cravings strike for something naughty like a burger, don’t reach for the takeaway menu. Just make your own, healthy versions! This burger definitely won’t leave you with the guilt that plagues after a greasy takeaway. For added detoxing, nix the bun! Pizza doesn’t have a great reputation. It’s known for being the highly calorific, unhealthy takeaway that we usually cave into due to its crunchy texture and gooey cheese. Luckily, pizza is easy to recreate in a healthy, tasty way too! 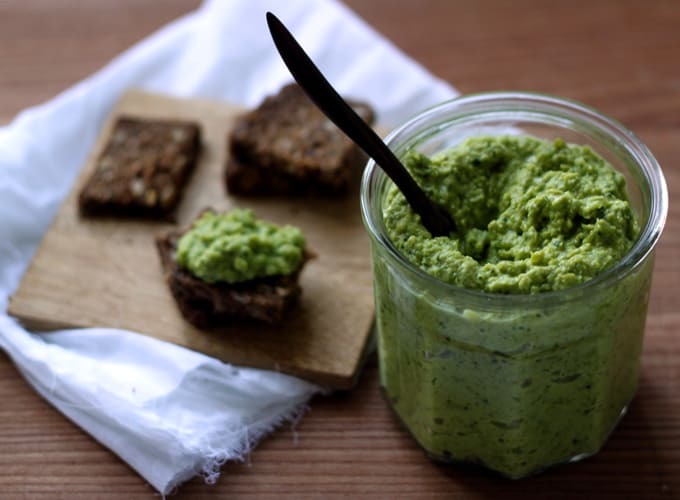 The whole wheat base can be swapped for spelt or gluten free flour, then it’s all topped with detoxing broccoli stem pesto, kale and asparagus with some lemon. 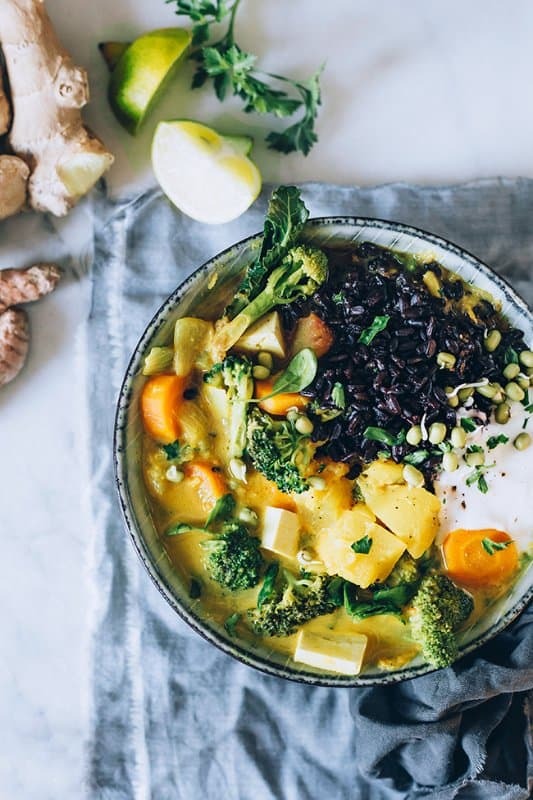 This spicy, flavourful dish is packed with several detoxifying spices like lime, ginger and tamari, as well as fibrous, nutrition dense veggies, and black rice. Can’t find that? Sub in brown rice instead. I can’t wait to get in the kitchen and whip up this bowl again! The smoky and slightly spicy sweet potatoes go so well with the salad, beans and avocado sauce. 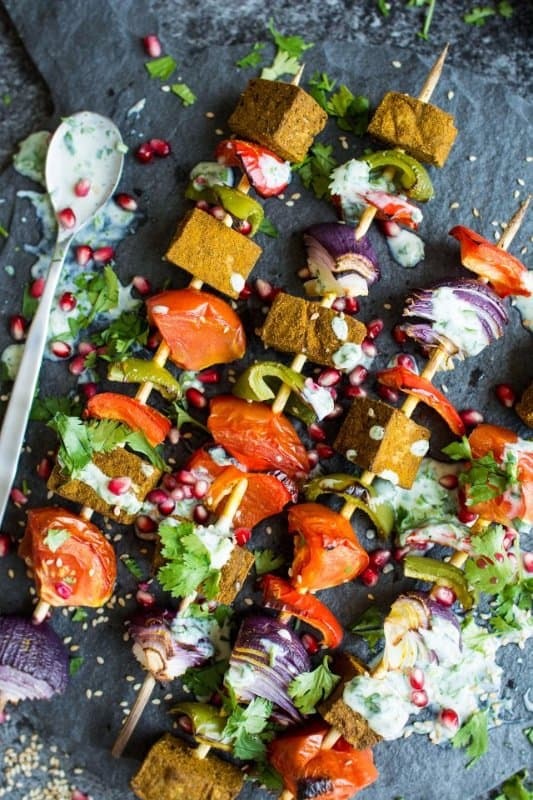 With so many flavours and textures, this recipe just goes to show how delicious a plant based diet can be. It’s a good idea to prep all the ingredients in advance and saving them in the fridge, perhaps doubling the yield so you can put this bowl together for dinner for several days in a row. If you’re thinking ‘tofu – eww!’ then think again. For ages now tofu has gained gga really bad reputation for being that bland, boring food that vegans live on. And yeah, eating a raw chunk is kinda yuk. But it can indeed be yummy, too – it’s basically a flavour sponge, so the best way to enjoy it is to either marinate it or coat it in spices and shallow grill it till it’s slightly crispy on the outside. The marinade in this recipe is super easy to make and teriyaki based, which is so delicious – I even added some to the bed of quinoa, too. Are you starving? Like, really hungry? Good! Detoxing doesn’t have to mean suffering. Eat loads – just eat clean. 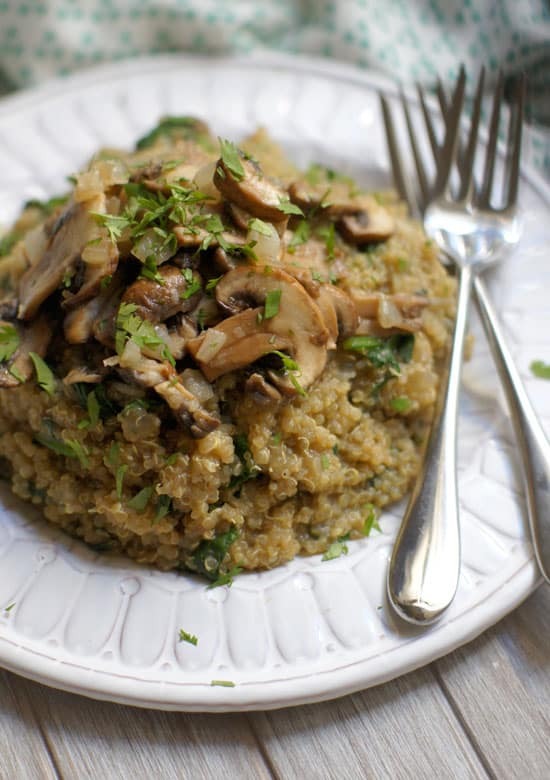 This quinoa mushroom risotto is super filling, fully vegan, and rich in protein. You can serve it up as it is, or hollow out some squashes and stuff them with this to make a truly satisfying meal. It goes without saying that any recipe here won’t have meat. So, you ask, how can you make a shepherd’s pie without it? 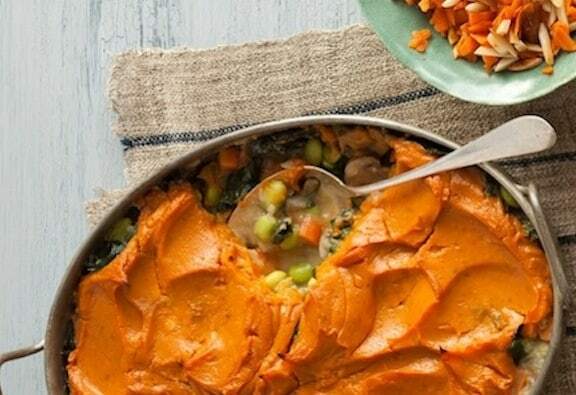 It’s actually pretty easy: with a variety of garden veggies and kidney beans, all topped off with a creamy sweet potato mash. Yum! Creamy, spicy, healthy. This recipe has it all. Whilst the winter vegetables are quite filling and the spicy baked tofu adds some protein, I would personally love to serve this up with some brown rice, moistened with a bit of the extra vegan sauce and a dash of lemon juice. Oh, and some extra coriander. You know I love that stuff! Beets are one of the healthiest veggies out there! Beetroot is a powerful blood cleanser, antioxidant, and is packed with fibre. Why not serve it up in the tastiest way possible: in burger form? When you find yourself a little on the hungry side with no idea of what to eat, just have a little pot of these. 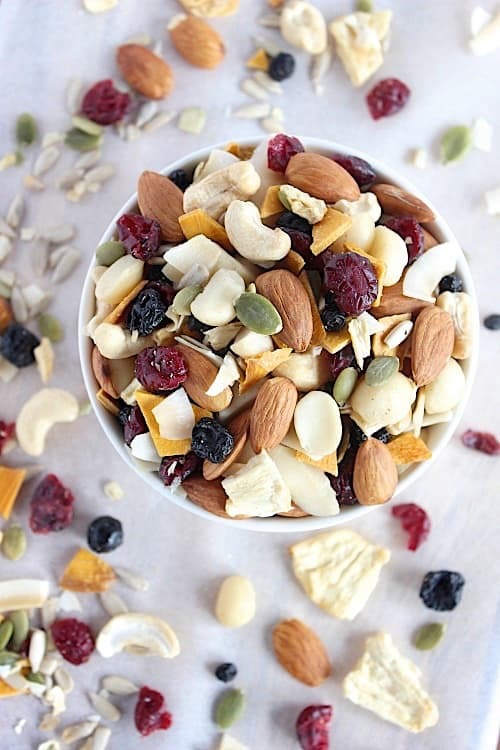 Packed full of superfood fruits and nuts, these guys are not only healthy, but a little dosage of energy as they’re going to keep you filled up until you eat your next meal. If you’re trying to steer clear of sugar based treats, these little snacks may be just the detox recipe you need. Try lashings of lime for a more citrusy vibe, or even a drizzle of maple syrup for added sweetness. These are pretty much a detox version of peanut brittle! Once roasted, the chickpeas will harden up and have a wonderful crunch to them, making them a great switch from candy. Make a batch of these and store them in a lock tight jar for whenever the munchies strike. I’ve said it before and I’ll say it again: detoxing isn’t about deprivation, it’s about finding better alternatives to processed food – and these kale chips are the perfect substitute for anyone who is a fan of chips – especially the salt & vinegar variety! Ok, sometimes you just need a bit of cake! And this recipe by the Minimalist Baker is a real winner. Want to reduce the calories and increase the goodness? Skip the icing – it’s still damn tasty without it! 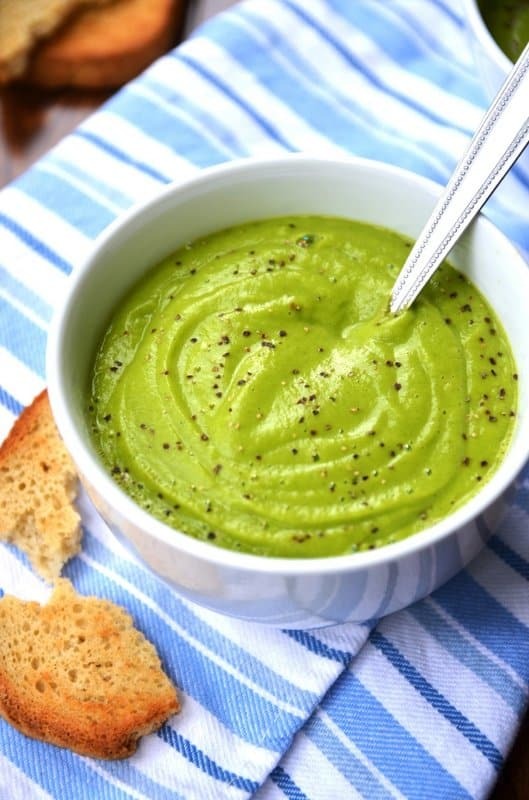 Detox dips are a really great option to have on hand – you can enjoy them as a quick snack or an appetizer; dollop on top of a salad or serve as a side dish with veggie dippers. You may just love the fresh, spring flavours in this dip, it could well become a perennial favourite! Main image: Vegan Burrito. Get the recipe here. Can anyone assist me to having a tiny query. I would like to try out some eating plan against Candida. On the internet, a lot of information about this issue. But thoughts commonly diverge. And I did not find the appropriate selection for myself. Possibly the forum members may recommend an established diet or simply a lot of recipes against candida? Hi Clayton! The best thing you can do is avoid sugar and yeast at ALL COSTS!